First, a reminder that Grains and Village Greens' delightful produce will be on sale outside the Pack Horse again this Saturday, 10-12.00p.m. as usual - except Grains can't be physically present. But they've arranged for Village Greens to bring their stock of loaves, croissants, pastries etc (thank you Village Greens!). Although there'll be a good range, volumes might be slightly down on normal so it's doubly sensible to order your bakery products in advance, so you can be sure it's wrapped and ready to pick up. Grains can be contacted on 01457 862346, for such orders. Second, the afore-mentioned Village Greens are up for an award! They're in the running for the Observer Food Monthly Awards, influenced by popular vote. They've been runners-up in the past (Independent Retailer category). It would be great if, on the back of their unstinting support for the 'pop up' service they offer each Saturday in Hayfield, and the quality of their produce, if a good number of us supported them for this award. Will you? Here's the link. Click on this and then on the 'go to' page which then appears below. Thanks!. Third, the Hayfield Library Campaign Group has now made a submission to Derbyshire County Council, expressing interest in working with the Council around retention of Hayfield library and development of the facility into a 'community hub'. This is not a bid for community management of the local library service, but is intended to be a constructive, alternative approach to augment the library service and use of the building, requiring partnership with and from the County Council. What DCC makes of the 'expression of interest' is to be seen, but we think it relevant that you be aware of what has been submitted. A copy of the 'Expression Of Interest' is attached, for your information. We hope you have a thoroughly pleasant and fulfilling Easter. Today, some young people around the UK are gathering to protest the risks of humankind not doing enough to stem unalterable climate change. So it's worth letting you know that individuals and organisations are meeting in Derby next Tuesday evening, February 19th, to consider what can be done to get Derbyshire County Council to declare a 'climate emergency' and commit to greater efforts to achieve zero carbon status in the medium term, as other councils have already done. A group of folk are going from Hayfield, via a minibus organised by Graham Hirst. It leaves The Royal car park at 5.45p.m. and costs £7. There are still some seats left. If you'd like to be involved, please contact Graham at hirst34@icloud.com. A reminder that Village Greens and Grains will be outside The Pack Horse as usual, tomorrow, Saturday, 10-12.00p.m., with their delicious foods. This week, each V Green vegetable box will also contain a dessert recipe this week (roasted pineapple with chilli syrup). And there's the healthy, multicoloured fruits and veg we know! Grains will bring an exotic range of breads, rolls and cakes, as well as their delicious staples. Look out for flavourful cheddar & cumin, olive & rosemary, walnut, focaccia, and Danish pastries as well. Can you afford not to be there? Can you please bring your own shopper bags (about half of you do), since Grains want to cut down on the bags they have to issue – and we know that makes all-round sense! As ever, to be sure, order in advance (V Greens 01457 852456, Grains 01457 862346), and then just collect! And we in Sustainable Hayfield need someone to help our established team source, cultivate and support an appropriately varied range of stallholders and activities, to help ensure our Apple Day offers a vibrant and appealing range of attractions. Could this be you? Do you have (some) time to give? To begin with, you’d be shadowing someone experienced in this field, so you'd find out about what’s needed, before taking on more responsibility. If you’re interested, and want to become part of our ‘team’, please contact me in the first instance for a chat. I'm on 01663 745940 or 07867 578326 and at lauriejamesis@btinternet.com. Thanks very much for considering this! The winter newsletter from Sustainable Hayfield is now available to download. It's packed, we hope, with items which may interest you. We hope you enjoy! As ever, any feedback is much appreciated. 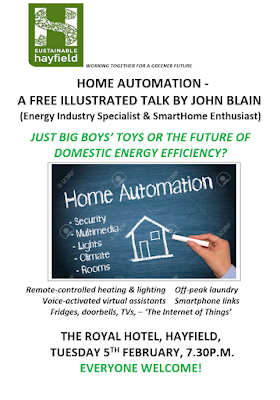 It's profiled in the newsletter but we'd like to draw to your attention the illustrated talk on 'Home Automation - Just Big Boys' Toys or The Future of Domestic Energy Efficiency?' 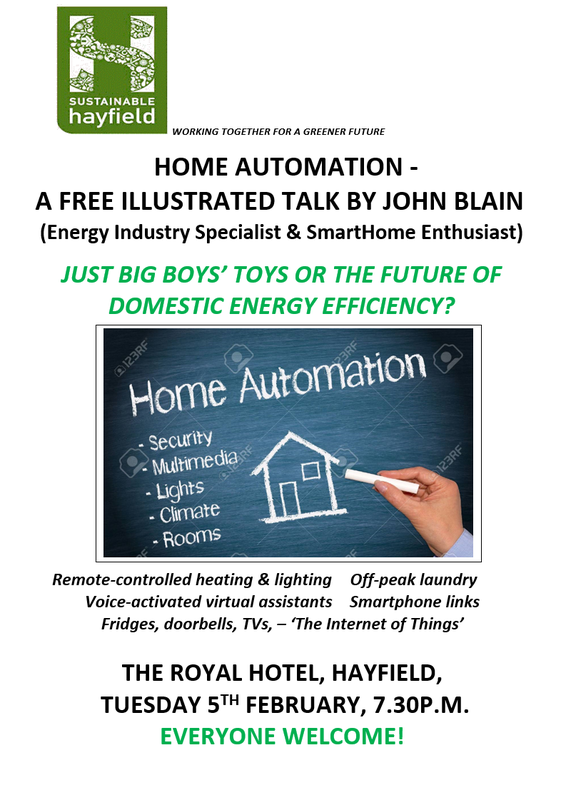 we've arranged for Tuesday February 5th at The Royal Hotel, starting at 7.30p.m., featuring John Blain, an energy specialist and admitted 'smarthome' enthusiast, who'll be addressing some of the key issues associated with the changing nature of technology in and around the home. It should be an interesting evening with, we suspect, a range of views shared! We hope you can join us.